Via eBay. 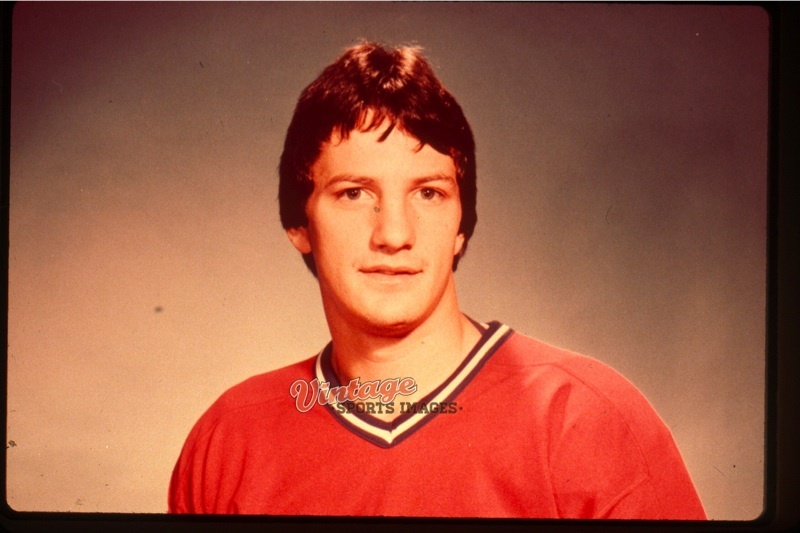 This is a very young Carbonneau, in his rookie season with the Canadiens. Excuse the watermark. First of all, congratulations are in order to Carbo's former teammate and Habs assistant, Kirk Muller, on being hired as the Carolina Hurricanes' new head coach. Muller is a rookie NHL head coach, replacing Paul Maurice behind the bench (who has been fired by the Canes for the second time in a decade). Best of luck to you, Kirk! 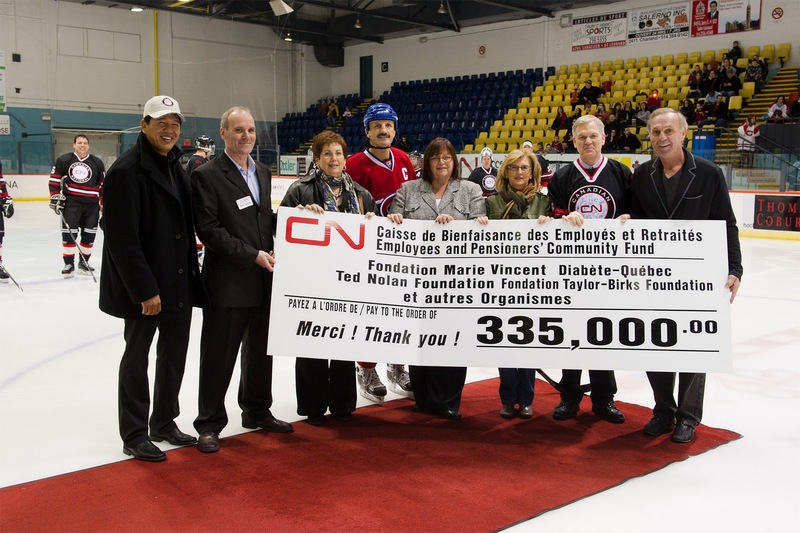 On November 23, Guy took part in the seventh annual CN Hockey Greatest Stars challenge, which raised $335,000 to help charitable organizations supported by the CN Employees' and Pensioners' Community Fund. Guy played on a squad of former Montreal Canadiens that also included Steve Begin, Patrice Brisebois, Mathieu Dandenault, and Stephane Richer. Guy is included in a box set of 12 prints by the artist Pierre Pivet, featuring Habs legends. These prints are signed and come in a limited edition of 875, priced at $2,950. More information about these prints can be found here. On Thursday, December 1, starting at 6:30 PM, Carbo will be at Bar Au Diable Vert (18+ only), located at 4557 rue Saint-Denis in Montreal, for a showing of Game 5 of the 1993 Stanley Cup Final between the Canadiens and Los Angeles Kings. The coach of that winning Habs team, Jacques Demers, will also be at the event. Tickets are $10 and can be purchased at the door. All proceeds are being donated to the Great Food Drive. On Friday, December 2, Carbo will be at the Sportplexe 4 Ice Pierrefonds, as part of a tour sponsored by Canadian Tire, helping young people with their hockey skills. 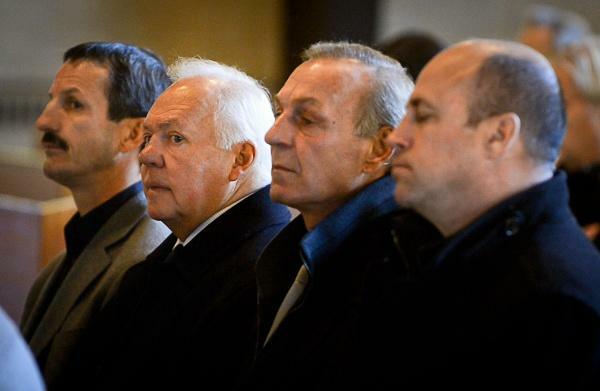 Stephane Richer, Gaston Gingras, and Patrice Brisebois will also be in attendance. A total of 3,000 young hockey players aged 7 to 12 years, from Novice, Atom and Peewee, try their luck across Canada. The top five boys and five girls in the best overall ranking in each category will participate in the grand finale presented on the Rideau Canal, Saturday, Jan. 28. 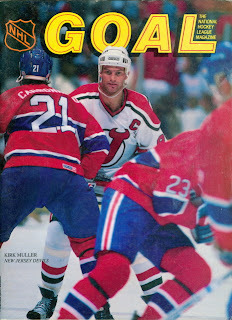 Carbo's friendship/professional partnership with Kirk Muller is long-standing. The number-two draft pick in 1984 (behind Mario Lemieux), Muller joined the Habs in a trade in 1991 that saw Stephane Richer dealt to the Devils. Of course, Carbonneau and Muller's greatest achievement together was that Stanley Cup win in 1993. The two became teammates again in the 1999-2000 season, when Muller joined the Dallas Stars. That's why, in 2006 when coach Carbo was putting his staff together, Muller was a natural for the position. 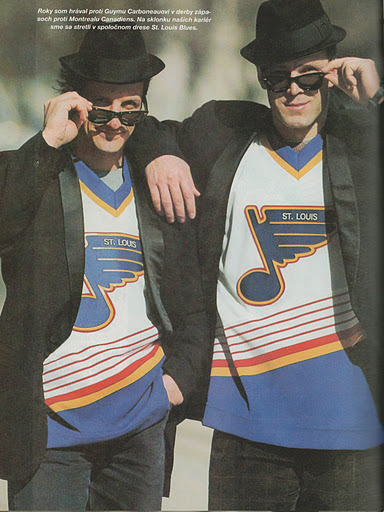 Carbonneau and Muller, before they were teammates. What's it like to be here this weekend to help honor two of your ex-teammates (Belfour and Nieuwendyk) that you went through so much with? "It's unbelievable. I always say you make a lot of friends just by playing hockey but probably your best friends will always be the players you won the Cup with. I remember '86, '93 and '99 was a great season for everybody. Having a chance to play against all four guys that are inducted, and especially with Joe and Eddie in '99, it's a thrill." What was it like to go against Gilmour in those Montreal-Toronto rivalry games? It is also time for another State of the 'Stache report! As part of the 40th anniversary celebrations of the Alma Provincial Midget Hockey Tournament in Alma, Quebec, Carbo will be participating in a Legends game this Friday, November 11. 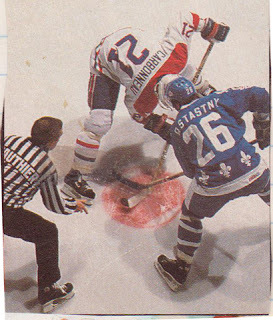 Other Canadiens alumni taking part in this game are Patrice Brisebois, Stephane Richer, Mathieu Dandenault, and Guy Lafleur, who will be acting as coach. Carbo is slated to play in the Haggar Hockey Hall of Fame Legends Classic at the Air Canada Centre this Sunday, November 13 at 2:00 PM. This game pits Team Bourque against Team Salming. Carbo will be playing on Team Bourque, which also includes Raymond Bourque (of course), and former teammates Steve Shutt and Joe Nieuwendyk, who is a 2011 Hockey Hall of Fame inductee. This year's other inductees are Doug Gilmour, Mark Howe, and Ed Belfour (another former teammate). The author will avoid going on a long rant about how Mr. Carbonneau deserves a spot in the Hall of Fame as well, but yes, she has very strong feelings on that subject. Further info on the Legends Classic: here. Carbo took part in the second annual Habs' FestiFan this afternoon at the Bell Centre. 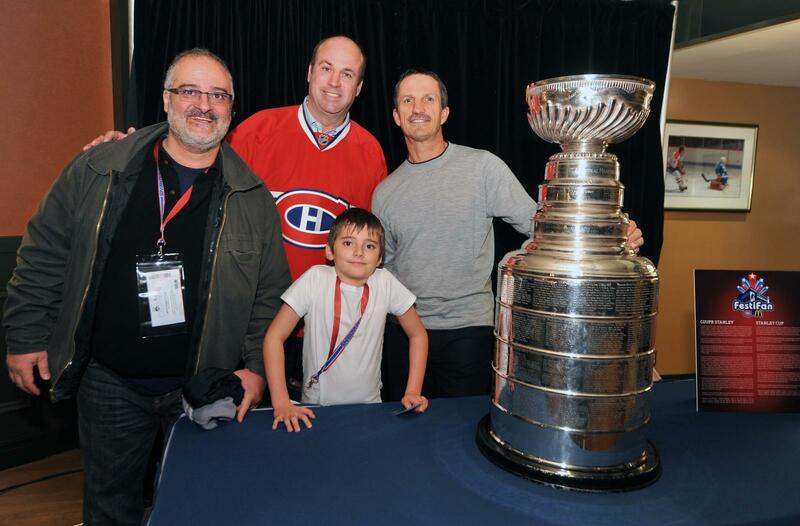 The event included inflatable rides, skill-testing games, and a meet-and-greet with Canadiens alumni. 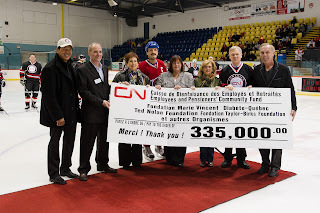 Proceeds from the event were donated to the Canadiens' Children's Foundation and Ronald McDonald House, to benefit children in the province of Quebec. I am back from visiting my late friend Liz's family and attending a Sens game, and I cannot speak enough about the kindness and hospitality that was shown to me. I think Liz's wonderful family are a large reason why she was, and still is, an inspiring and exemplary human being. Thank you Randy, Linda, and Scott. 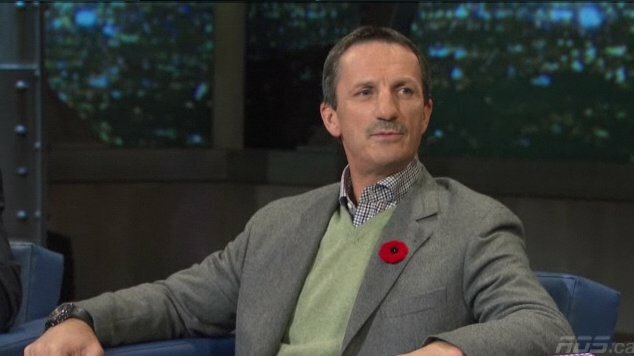 While I was away, I was alerted to the news that Carbo is growing a moustache for Movember (of course, this is to raise awareness and money for prostate cancer research). This pleases the author greatly; my brother has also joined the effort which makes me very proud. 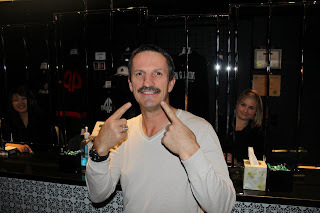 Anyway, with this comes a new feature to the blog: the first State of the 'Stache report. As you can see in this screencap from L'Antichambre, Carbo's moustache is in its very early stages. It's almost hard to tell that he's trying to cultivate something there. There will be more reports as Movember (and Carbo's moustache) progresses! This is something of a return to Carbo's roots; he also sported a moustache while playing for the Chicoutimi Sagueneens. This is my friend, Alice Ervin. I knew her as Liz -- her middle name was Elizabeth -- a devoted Sens fan who eventually took on moderator duties of the Ottawa Senators community on LiveJournal. 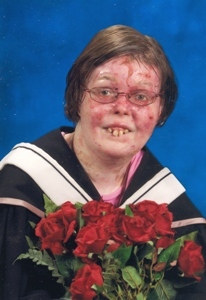 Liz had a rare skin disorder known as epidermolysis bullosa (EB). This disorder affects less than 200 people in Canada, and affects the connective tissue between skin layers, leaving those who have it prone to cuts and infections. Liz was a bright student, attending Ottawa's Canterbury High School and eventually graduating from Carleton University's journalism program. She had dreams of becoming a sportswriter. She developed skin cancer -- those with EB are at a higher risk of skin cancer than others -- and passed away this past March 20 from an infection that could not be controlled. I did not know that she even had EB until she passed away. That was Liz -- she didn't want pity, she just wanted to be treated the same as everyone else. That was the determination that got her through Canterbury -- graduating at the top of her class -- and the journalism program at Carleton, one of the most competitive in the country. Even though her disability limited her; she had to limit human contact and because her mouth was so small, she received her nutrients through a feeding tube. I am also a fan of the former Sens goaltender Pascal Leclaire. In 2009, even though Liz was already battling the skin cancer at that time, she went to the Sens store with her mother to pick me up a Leclaire shersey. Because I am 90 minutes away from Ottawa, and there were none in the stores where I am. She was utterly, completely devoted to her friends. I still have the shirt; it is very worn now. 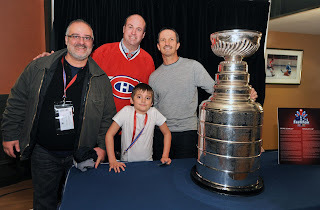 To keep this post on topic, Liz used to tease me about my love of Carbonneau. She was among the first to commiserate with me when he was fired from the Canadiens in 2009; she thought the firing to be stupid and premature. Although her first team was the Senators, she also considered herself a Habs fan. And so, her family has invited me to attend a Sens game. I consider this a great honor. I have enjoyed getting to know her mother, Linda, via e-mail these past months, though I wish it had been under different circumstances. It is a testament to Liz's indomitable spirit that those who knew her online and offline; through hockey, and through the fictional fandoms she was involved in -- will certainly never forget her.